Located in the Notting Hill district of the Royal Borough of Kensington and Chelsea, Portobello Road serves as the Portobello Market selling various goods each day. Antiques, second-hand clothing, fruits and vegetable are just some of the things you can find at the market. It’s opened daily, with Saturday being the most busy as locals come here to enjoy the bustling atmosphere. 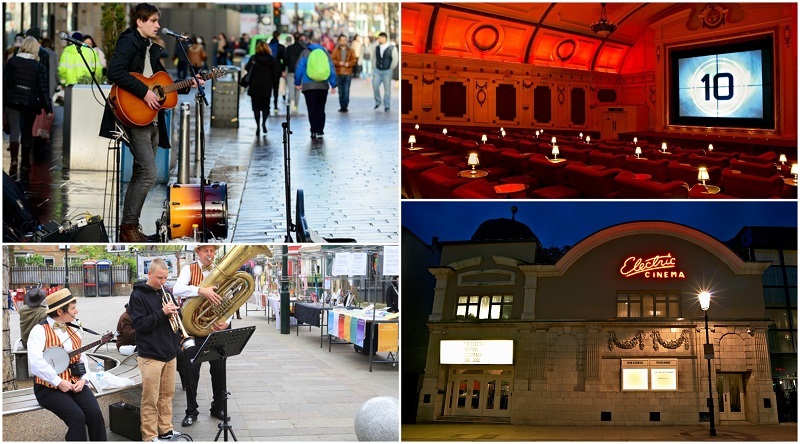 Check various tours available in the area to get the most out of your time at Portobello Markets. Portobello Road Market is mostly known for its impressive selection of antiquities, displayed here every Saturday. Visitors are free to browse and pick from a variety of furniture, glassware, decorative objects, silver, toys and clothing. The Portobello Road Market is the largest antique market in the UK, which makes it a prime tourist attraction and an optimal destination for a Saturday morning stroll. The market does not only trade antiques, but also fruit and vegetables, albeit, on different days. While the antique stalls can be found on Saturday, the other vendors are there during the week. In fact, the Portobello Road Market actually started out as a fresh food market in the 1800s, only for the antiquity vendors to come along later, in the 1940s-1950s. The street retains a dynamic, energetic vibe, which is also intimate, as a result of the unique and beautiful Victorian architecture, with terrace houses and meandering streets. At times, there’ll be street performers entertaining the crowd with their unique talents. 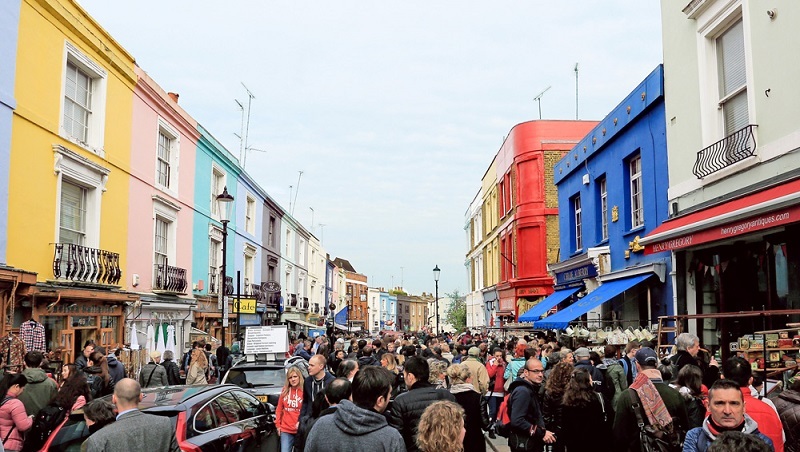 Portobello Road is also popular for hosting the Portobello Film Festival every August as well as having one of the oldest cinemas in Britain, Electric Cinema. 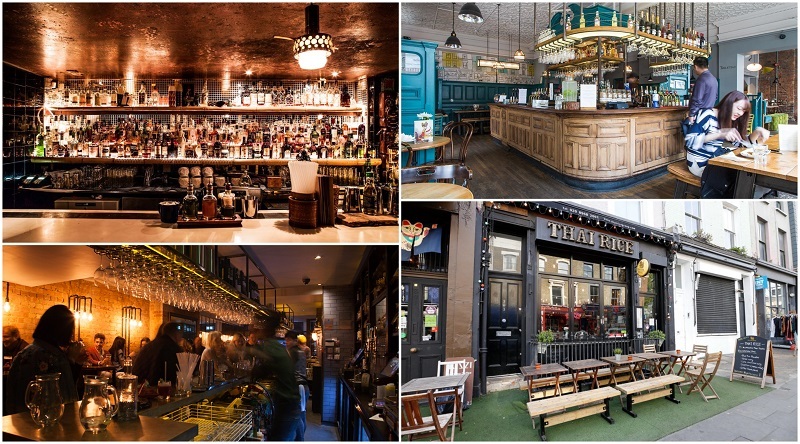 While the market is the most well-known feature of Portobello Road, in recent years, it has acquired a certain cosmopolitan ambiance, mainly due to the communities, as well as the large selection of pubs and restaurants. A variety of food outlets art at your disposal, should you wish to take a break from antique shopping. Hot or cold beverages, freshly cooked meals, street food or pastries, you can have your pick from the large selection. Bus – You can arrive at Portobello Road Market via buses 52, 452, 31, 94, 7, 27, 328, 12, 70, 23 and 28. London Underground – The closest underground stations to Portobello Road are Notting Hill Gate, on the District, Circle and Central Lines; and Landbroke Grove, on the City and Hammersmith Lines. Train – London Victoria is the closest station to Portobello Road Market. Car – You can easily reach Portobello Road Market by car, as it is situated only 3 km west of Marble Arch. Formerly known as Green’s Lane, Portobello Road was nothing more than a country path. The Portobello Farm was built there in 1740, named after Admiral Edward Vernon’s victory at Puerto Bello in the War of Jenkins’ Ear. Green’s Lane then became Porto Bello Lane and Vernon Yard, adjacent to Portobello Road. The Portobello Road we know today is a Victorian construction. Prior to 1850, it was just a country lane in an open field. In the latter half of the 19th century, the road was formed, little by little, holding markets and shops frequented by the rich, which stimulated economic development, and also provided employment for the working class, as domestic servants, tradesmen, messengers or construction workers. The Hammersmith and City Railway line was finished in 1864, along with the Ladbroke Grove station. An order of nuns bought the Portobello Farm and the St. Joseph’s Convent for the Dominican Order was built here, after the coming of the railways and the rest of the area was further developed. Around mid 20th century, the antiquity market began taking shape, as antique dealers and tradesmen set up their stalls, selling and trading old items and second-hand clothing. Portobello Road lends its name to Muriel Sparks’ short story, The Portobello Road, which is about a murderer who was haunted by his victim and meets her at the Portobello Road. Her 1958 collection, The Go-away Bird and Other Stories includes this short story. Dire Straits had a song about Portobello Road on their 1978 album, Communiqué. The Song was called Portobello Belle. There is a board game called Portobello Market, inspired by this market. Portobello Market served as the setting for Notting Hill, which was filmed here, on the street, in 1999. The action in Paulo Coelho’s novel from 2007, The Witch of Portobello, also took place here. The popular British children’s book series Paddington Bear, from Britain, created by Michael Bond, heavily features Portobello Market. Paddington Bear is the main character and Mr. Gruber, his friend, has a shop in which he sells antiques on the Portobello Road. Paddington visits Portobello Market every day. A documentary called Portobello: Attack of the Clones was shown at Portobello Road’s own Electric Cinema in 2006. The short film was 20 minutes long and it covered the threat that high street stores pose over the spirit of the street.